Canada-based travel marketplace Demeure has raised $4 million in its third round of seed funding from about 50 Canadian private investors. This brings the startup’s total funding to about $8 million, but it has not yet raised any institutional funding. After a 24-month pilot, Demeure’s platform for buying and selling properties launched publicly last week. Demeure targets higher-end travelers by using a service subscription model, where renters and owners can choose between an entry level account or a premium account for added benefits. Users list and search properties based on location, bedrooms, budget and keyword. They can also bid on specific rental homes listed on the site. CEO Peter Schwartz tells me the funding will go toward ramping up sales and marketing, as well as improving the platform by increasing user privacy and engagement. Unlike other travel rental sites, Schwartz says Demeure does not monetize through website traffic, advertisements, customer transactions or user data. “This is an opportunity for people to see the value of a marketplace, without any focus on data or ad monetization getting in the way of what we do,” he tells me. Instead, the startup offers perks such as booking priority and exclusive properties to travelers for a premium plan of $495/year. From the other side, property plans range from $495/year to $995/year. 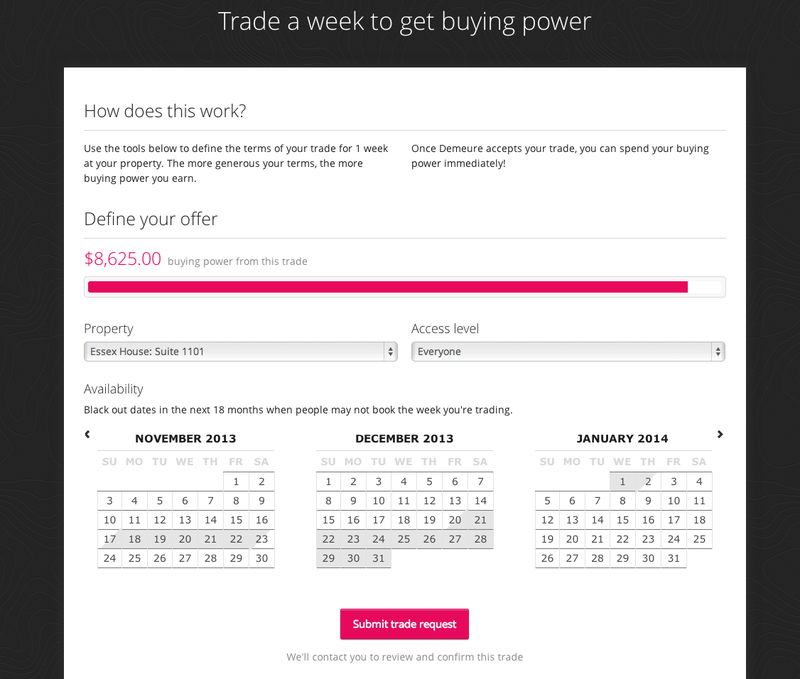 Property owners can also trade empty nights for currency through Demeure. The company is entering an industry with well-established market competitors such as Airbnb and HomeAway, both of which have been covered extensively by TechCrunch. Schwartz tells me Demeure differentiates itself by providing a service model and controlled marketplace, so users know exactly what to expect. “As you move our market to the mid and high-end, the service requirement gets much more involved than basically offering a list of properties and we bill you to book a commission,” he says. “In particular, the ability to monetize empty nights and a number of other services.” Those services include the curation of private properties through about 100 partners, as well as hired host agents to provide service for private properties. Demeure has about 1,000 users and aims to reach 25,000 by the end of the year. Schwartz tells me the company’s projected revenue this year is $2 million, with a revenue run rate of $7 million by the fourth quarter of 2013.